Extranet with product catalog and media libraries for images, documents etc. There are two basic things that make this difficult. On one hand it's the undefined amount of assets (requiring a 1-item-to-X-assets data-model) and it's the maybe-needs-grouping (where editors expect a folder, not a group-dropdown-field). The data model for a programmer is fairly straightforward, and all the solutions are setup +/- the same way. BUT it's complicated, and from my experience web-designers find it hard to model this - both from the data side as well as the templating. What adds problems is that each asset quickly needs additional information. Often the designer/developer will assume that the file-name will suffice, till an additional requirement appears like: "the real-estate photo should show the author, the gps-coordinates and have a description with keywords for google". So basically each asset needs 1-100 more fields to fill in - and this too causes many issues. 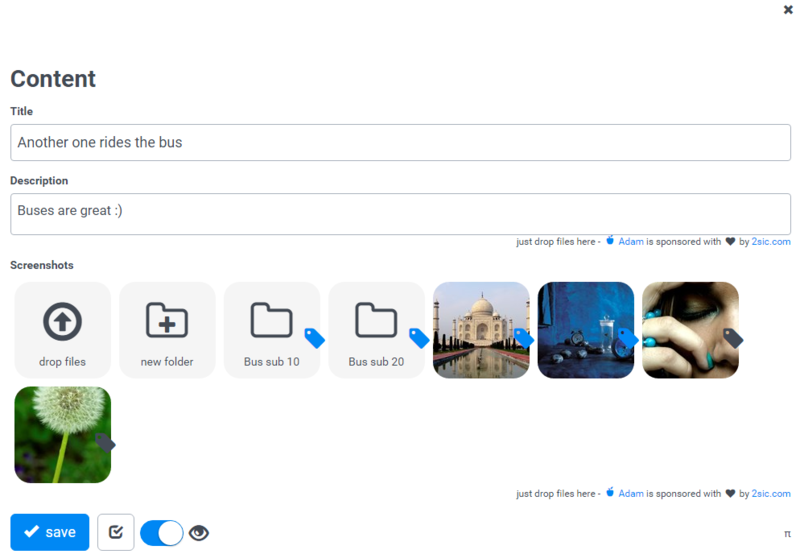 A new field-type called library - which is a field which allows you to add unlimited files. So a content-item can have one or more of these, allowing you to have a Product content-item with a Photos library and a Manuals library and another Applications library showing customers using the product. Each library can also have folders and sub-folders (configurable). 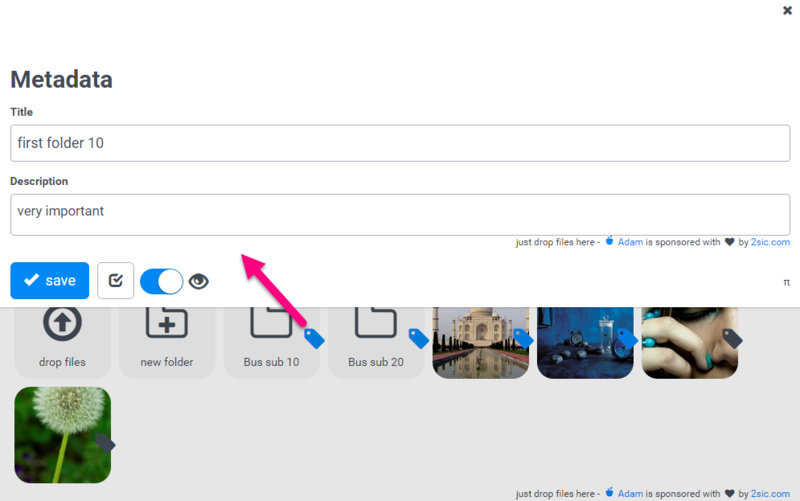 This allows you to require that the Applications library is grouped into Albums (folders) while the Manuals are not. You can create another content-type - like ManualDescription - which you can then tell ADAM to use as file-metadata. ADAM will then let the editor tag each file with this information. 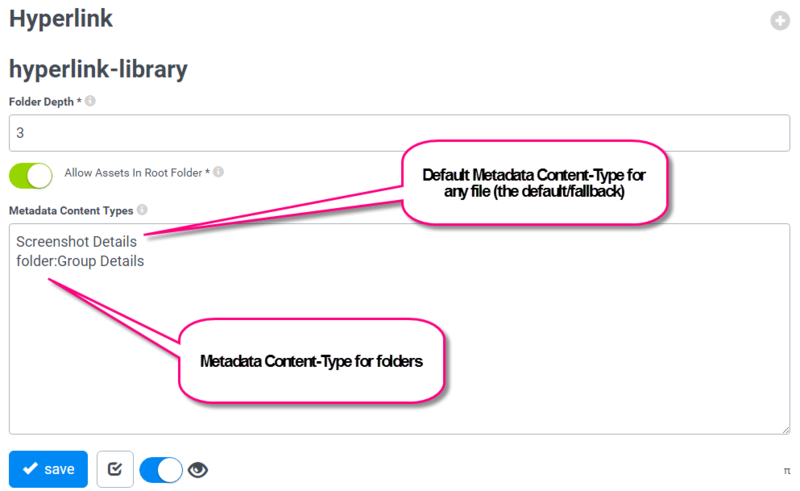 You can create even another content-type - like Application Group Metadata - which you can use as folder-metadata. This allows the editor to tag each folder with additional information. 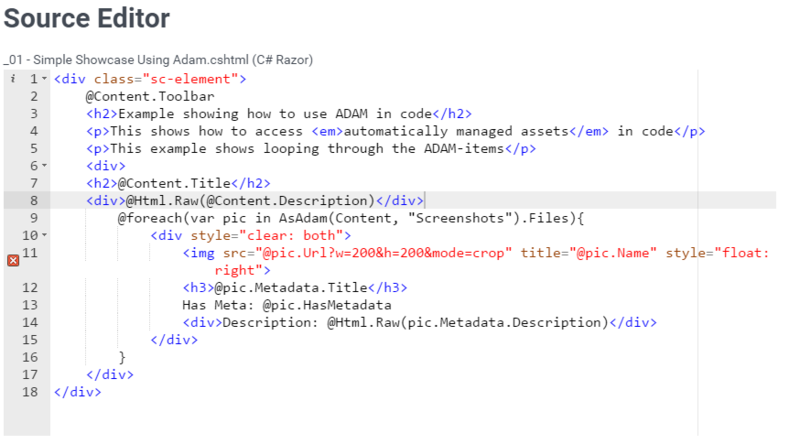 The Razor Engine has a new API so that you can use AsAdam to access / loop through these assets and the asset metadata. To demonstrate all this I created a demo-app called Tutorial ADAM. The following screenshots are from that app so and will help you get started. As you can see, the screenshots are fairly intutive, and folders / new-folder and files appear directly. Note that most file-types have an own icon (like ZIPs, PDFs, etc.). Upload is drag-and drop. So again very trivial and barely needs training. And yes, the metadata supports every possible feature in 2sxc - including WYSIWYG. It could even contain another library of assets. Again - straight forward, easy to do. After this the content-editor already has the UX described above. As you can see line 9 contains the foreach-loop and line 11 creates the thumbnail with a title showing the name. Line 14 shows you the WYSIWYG-description retrieved from the Metadata. Another days work was invested to ensure export/import works, because many things like folders can have metadata, but were never included in the export. This too was ensured. Note that an App containing ADAM will now include all ADAM assets - and because of that it can easily be 10mb or even 50mb. Be aware of this when you re-import it somewhere, because you often have web.config settings limiting the upload size. You will need the newest 2sxc (at least 8.01.00) and the demo app.